Hakonen system, Lonetrek region. On the 2nd of March at 21:00 EVE Standard Time, an enormous sub-capital battle was hosted in the system which saw more than 1400 players involved and 180 billion ISK in ships destroyed over a period of 2 hours of fierce fighting. 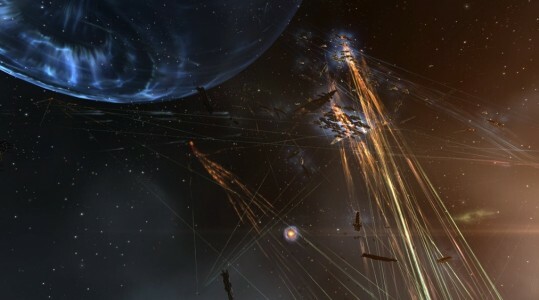 The battle was prompted by members of the loose coalition known as Low Sec Voltron (LSV), who had previously reinforced two Imperium towers in the system. With the towers coming out of reinforced mode on the evening of the 2nd of March, both sides geared for a major clash. The Imperium brought two Machariel battleship fleets, a Proteus strategic cruiser fleet and an Ishtar heavy assault cruiser fleet with large interceptor and electronic warfare wings present as well. Against this, LSV managed to field a full Machariel fleet (256 pilots) comprised of alliances such as Snuffed Out [B B C], Shadow Cartel [SHADWC], Dead Terrorists [IKILU], Mercenary Coalition [MC], Suddenly Spaceships. [CYN0], Project.Mayhem. [16-13] and more. This fleet was supported by a 90 pilot Pandemic Legion [-10.0] Vulture fleet, a 190 joint Psychotic Tendencies [TISHU]/Northern Coalition. [NC] Proteus fleet and a 70 pilot The-Culture [-T C-] Cerberus heavy assault cruiser fleet. Other fleets present were a joint The OSS [OSS]/Hax. [HAX.] Cerberus fleet, estimated at 40 pilots, and a Pandemic Horde [REKTD] Cormorant destroyer fleet, estimated at 50 pilots total. The Imperium Machariel fleets settled on one of the reinforced towers in the system while the enemy fleets made their way to it, the LSV fleet gathering at the Hakonen gate in the Nalvula system before jumping in and warping to one of the stations to wait for further reinforcements. The joint Proteus fleet arrived early, but was quickly chased from the grid by the Imperium Machariel fleets, forcing it to wait for the LSV fleet to commit before returning. With more allies arriving in the system, the LSV fleet prepared to fight the Imperium Machariel fleets. The-Culture’s fleet jumped the gun and warped to the grid before the LSV fleet, exchanging a few blows with the Imperium Machariel fleets and acting as the opening shot of the fight. The-Culture’s Cerberus fleet could not contend with the Machariel fleets, and withdrew quickly before the LSV fleet finally sprung into action, warping to the grid and landing in close proximity of the Imperium Machariel fleets. The two sides opened fire immediately, exchanging projectile barrages at close range, often times only 15 to 30 kilometers separating the two sides. As the battle got heated, the Imperium brought several triage carriers to the field, the LSV fleet having fielded two from the start. 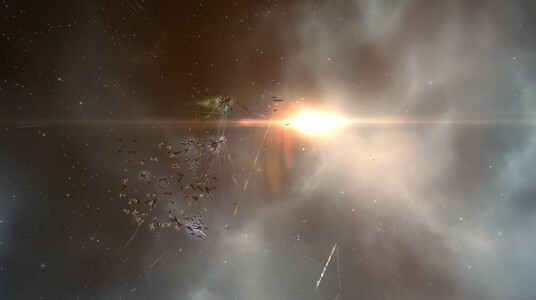 Both sides began a murderous exchange, overwhelming each others’ mainline ships as allies for both sides joined the fray. Pandemic Legion’s Vulture fleet came at long range, keeping a good distance from the Machariel fleets and sniping from a distance, focusing on their logistics wing. The-Culture did the same, though mostly targeted Imperium battleships, teleporting away from the melee and destroying them. The joint Proteus fleet focused mainly on the logistics wings of the Imperium Machariel fleets, maintaining a close proximity to the battle, hovering around 50 kilometers from the maelstrom. With the amount of pressure exerted by the different fleets, the Imperium Machariels suffered heavy losses, inflicting some in return but losing logistics cruisers and mainline ships at a growing rate. An Imperium Proteus fleet was brought in as reinforcements to deal with the joint Proteus fleet, but even this was not enough to slow the destruction of Imperium ships. Having to contend with a rival fleet, the joint Proteus fleet was forced to increase range from the melee and put some distance between it and the hostile fleets. It also changed the focus of its tracking disruptors to the enemy strategic cruisers in order to decrease their effectiveness, but continued firing at the Machariel fleets’ logistics. As losses piled on both sides, one of the Imperium Machariel fleets was forced to perch, after a large chunk of its mainline ships were dispersed by command destroyers. The fleet quickly warped off the field, giving hope to the coalition forces that the Imperium’s force was close to breaking. That hope was quickly extinguished when the Machariel fleet returned to the field, landing on top of the joint Proteus fleet. The joint Proteus fleet found itself in an undesirable position, hammered by the two Machariel fleets and the hostile Proteus fleet. In rapid succession strategic cruisers exploded, their tank unable to withstand the sheer firepower possessed by the three fleets. The logistics wing of the joint Proteus fleet could do little to cope with the situation, forcing the fleet to withdraw from the field or risk total annihilation. As the joint Proteus fleet warped out, attempting to re-group and return to the field once more, the Imperium fleets closed in on the LSV fleet. With the added pressure of the energy neutralizing battleships the Imperium possessed, the logistics backbone of the LSV fleet was slowly eroded. What’s more, with the battle raging for a couple of hours by now, fatigue started to settle in. As the exchange became more even and with its logistics wing taking a heavy beating, losing ships at an alarming rate, LSV fleet commanders had no choice but to order a retreat or risk losing their entire fleet. Thus, the different allies were notified of the decision to extract. The joint Proteus fleet returned to the field, focusing fire on energy neutralizing battleships to relieve some of the pressure on the LSV fleet as it attempted to warp out, Imperium interceptors managing to tackle a fair number of battleships in the process. With the LSV fleet retreating, the other allied fleets withdrew as well, allowing Imperium forces to claim the field and the objective. For the Imperium, after clearing the field from enemy stragglers, it repaired the towers and extracted safely, having won both the field and the objective. Thus, hostilities in the system came to a close. The fight broke several records, managing to host 1400 pilots, with Time Dilation at first being unnoticeable. However once the fight progressed and, reportedly, both sides deployed drones, Time Dilation spiked, staying at 10% throughout the fight. All told the battle lasted 2 hours. The Imperium lost 200 ships in the battle, including but not limited to 2 carriers, 104 battleships, 9 strategic cruisers and 6 heavy assault cruisers for a total of 80.85 billion ISK damage. 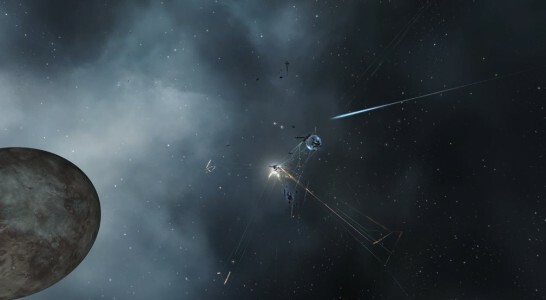 The loose coalition of alliance fleets suffered a total of 144 ship losses, including but not limited to 2 carriers, 30 battleships, 50 strategic cruisers and 6 heavy assault cruisers for a total of 95.65 billion ISK damage. The screenshots used in this article were taken by Interstellar Correspondents [ISD] and used with its expressed permission. All rights reserved to ISD. Hey there. I found your web site by means of Google while searching for a similar matter, your site came up. It appears great. I’ve bookmarked it in my google bookmarks to visit then. Hiya, I am really glad I’ve found this info. Today bloggers publish just about gossip and net stuff and this is really irritating. A good blog with interesting content, that is what I need. Thanks for making this website, and I will be visiting again. Do you do newsletters by email? Hey there. I found your site via Google even as searching for a similar subject, your site got here up. It appears good. I have bookmarked it in my google bookmarks to visit then. Good – I should certainly pronounce, impressed with your web site. I had no trouble navigating through all tabs as well as related info ended up being truly easy to do to access. I recently found what I hoped for before you know it in the least. Quite unusual. Is likely to appreciate it for those who add forums or something, website theme . a tones way for your client to communicate. Nice task..
Hey there. I found your website via Google while searching for a related subject, your web site got here up. It seems to be good. I have bookmarked it in my google bookmarks to visit then. What are several of one of the most popular/best blogs concerning mobile phone and also wireless tech? Hey there. I found your website by the use of Google while looking for a similar matter, your website came up. It appears great. I’ve bookmarked it in my google bookmarks to come back then. Hi there. I discovered your website by way of Google even as looking for a comparable topic, your site got here up. It seems great. I’ve bookmarked it in my google bookmarks to come back then. Hey there. I discovered your blog in the shape of Google whilst searching for a related subject, your site got here up. It appears great. I have bookmarked it in my own google bookmarks to come back then. Hello there. I discovered your blog by the use of Google at the same time as looking for a comparable matter, your web site came up. It appears good. I’ve bookmarked it in my google bookmarks to come back then. Hello there. I discovered your site by the use of Google whilst looking for a related subject, your site got here up. It appears great. I have bookmarked it in my google bookmarks to come back then. Hiya, I am really glad I have found this information. Nowadays bloggers publish just about gossip and net stuff and this is actually irritating. A good blog with interesting content, that’s what I need. Thank you for making this website, and I will be visiting again. Do you do newsletters by email? Hiya, I’m really glad I’ve found this info. Nowadays bloggers publish only about gossip and web stuff and this is actually frustrating. A good website with exciting content, that is what I need. Thanks for making this web site, and I’ll be visiting again. Do you do newsletters by email? Hiya, I’m really glad I’ve found this info. Today bloggers publish only about gossip and internet stuff and this is actually annoying. A good blog with interesting content, that’s what I need. Thanks for making this web-site, and I will be visiting again. Do you do newsletters by email? Hi there. I discovered your site via Google even as searching for a comparable matter, your website got here up. It seems good. I’ve bookmarked it in my google bookmarks to visit then. Hi there. I came across your website by the usage of Google at once as looking for a similar topic, your website got here up. It seems good. I’ve bookmarked it in my own google bookmarks to see then. Hello there. I found your web site by means of Google at the same time as looking for a similar subject, your site came up. It looks great. I’ve bookmarked it in my google bookmarks to come back then. Hello there. I discovered your blog by the use of Google while searching for a comparable matter, your web site came up. It seems great. I have bookmarked it in my google bookmarks to visit then. Hiya, I am really glad I’ve found this information. Today bloggers publish only about gossip and internet stuff and this is really frustrating. A good blog with exciting content, this is what I need. Thank you for making this web site, and I will be visiting again. Do you do newsletters by email? Thanks for any other informative blog. Where else could I am getting that type of info written in such a perfect way? I have a project that I’m simply now working on, and I have been on the glance out for such info. Hiya, I am really glad I’ve found this info. Today bloggers publish only about gossip and internet stuff and this is really irritating. A good website with exciting content, that’s what I need. Thank you for making this web site, and I’ll be visiting again. Do you do newsletters by email? Hello there. I found your web site by way of Google even as searching for a comparable topic, your website came up. It seems great. I have bookmarked it in my google bookmarks to visit then. Hello there. I found your web site by way of Google while searching for a related matter, your site came up. It appears great. I have bookmarked it in my google bookmarks to visit then. Hello there. I found your blog by means of Google whilst searching for a comparable matter, your site came up. It appears to be great. I’ve bookmarked it in my google bookmarks to come back then. Hello there. I discovered your site by means of Google while searching for a related subject, your website came up. It looks good. I have bookmarked it in my google bookmarks to visit then. Hiya, I am really glad I’ve found this info. Nowadays bloggers publish just about gossip and internet stuff and this is really irritating. A good blog with exciting content, this is what I need. Thanks for making this website, and I’ll be visiting again. Do you do newsletters by email?